Next post will probably be titled Sweater Weather and I will have officially contracted OFD. Fall is here guys! Every morning I wake up and am reminded that I need to go home and grab my fleece blanket, because I'm shivering in our chilly apartment. A couple days ago I woke up to rainfall and it made me smile as I snuggled deeper into my blankets. Then I jolted upright with a start and realized I needed to get to class. That's the thing about fall - I absolutely love this season, but its only enjoyable for lazy days. Ah well, I'm just thrilled to bust out my tights finally! This maroon pair have always gotten a lot of use during the colder months. Something about the rich, deep color that goes with a lot. 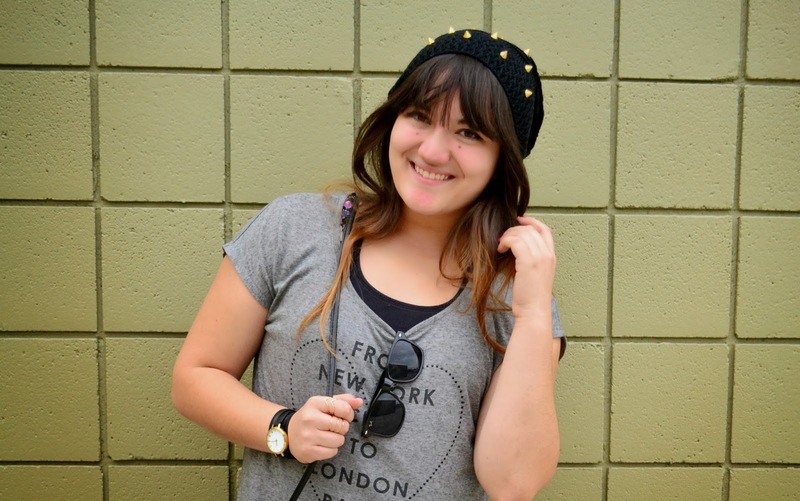 And get a load of this beanie guys - it has studs on it! When I discovered it at Rue 21 (for half off too!) I had to snag it. Its perfect! Its a good thing I change up my accessories often; because the truth is, I've basically been living in this shirt. I'm sure my classmates and teachers are probably wondering if I have any other tops at this point. I received these delicate, stackable rings from Shop Lately in the mail, and I love them! Such a tiny yet cute accessory to add on. Since a lot of my jewelry is mainly gold, they fit in wonderfully with my other pieces. A girl's gotta have her gold touches some days! You know, when I started stockpiling blog photos, I never thought I'd run into this problem...but it looks like I have actually taken too many in advance. I'm backpiling in drafts! Too many things to post and so little time - this blogging thing can be tricky. I love those burgundy tights! Those dainty rings are adorable! Great job! yay for layering! I love that ability when the fall season hits and the cooler weather starts. =) Great color on the tights! Ooh what I am going to miss most when it gets warmer here is the layering and being lazy part. Lazy-comfy as opposed to lazy-it's-too-hot-as-f***-to-do-anything. Enjoy love, and keep wearing that fabulous beanie! That beanie is an absolute win and you rock it. Love the maroon tights, makes me feel like digging mine out of the wardrobe. You know, I'm surprisingly happy about fall, particularly because I get to layer. Great idea with the rights and the floral skirt. I'll have to remember this outfit as an inspiration for myself. Love the color of your tights and those boots are too cute! It's definitely time to layer up here, too...we had -1°C here last night! Hi, Linda! I've got to say you look awesome) So chic and pretty) Those photographs are also adorable! Oh and dress up warmly, looks like the weather is getting colder everywhere!!! Love the tights and the skirt! love the Beanie Linda! So jealous you can now layer! Ugh. i so wanna bust my tights now too! anyway lovely as always. and by the way, it's always better to have stocks anyway so don't worry about it, pff. hehe. altho i have to agree blogging can get tricky! Major love for the tights too. Love the colour of the tights. I want a pair! Heh. tights. I used to love them, but after a summer of bare legs I find myself crying when I have to force my legs into them. Maybe time will toughen me up. ps: awesome rings! I love stackables. Stockpiling posts is like a blessing in disguise ;) At least you don't have to stress about having blogging material. Love the delicate gold rings! 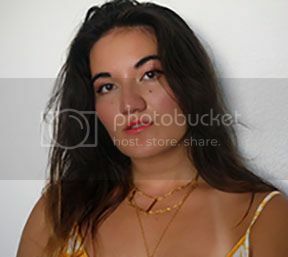 I love that you stock pile photos! I have a few, but need to get better at doing it, especially because I'm so busy! First off, both of your recent outfits are adorable!! I love the pops of color; your gray shirt is perfect for that! Fall is the best time of year, I think. It's actually the first time I'll experience a legitimate "autumn", too! So Excited for those leaves to turn!! Hope your weekend is going wonderfully!! I love your shirt, that's so cute! And I've fallen for fall too, I suffer from it and can't help but tell everyone how much I love fall. It really is the best season! I have a very similar pair of boots! 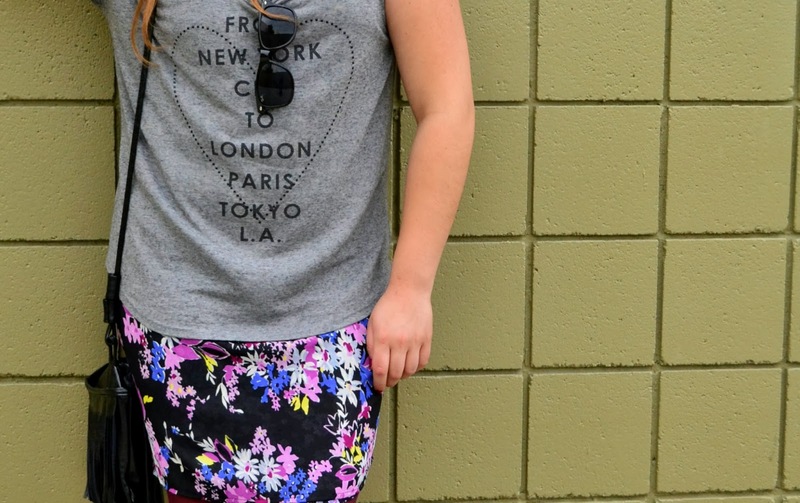 FLorals and a basic gray tee! I've having that blog issue too- I've just dyed my hair but still have weeks if posts! 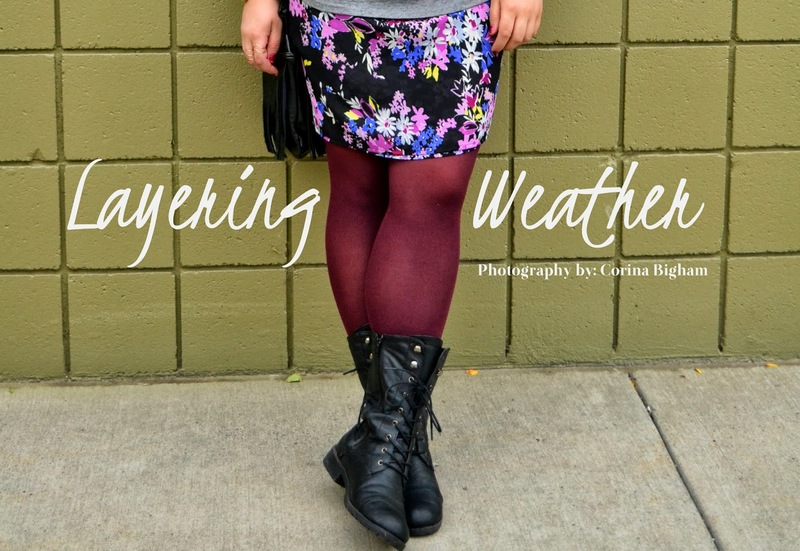 Love the vividness you brought to this outfit with those amazing coloured tights and the pretty print, I love layering and you do it with flair! Have a wonderful weekend doll! Gosh, I love your rings!! What a cool outfit. Nothing clashes, everything sits just right. Am a big fan of bold tights, so your maroon ones have stolen my heart. I love love love the colour of your tights. And that beanie? Perfect. omg Linda! this shirt! i'm loving your gray shirt! i'm also a fan too! it's so versatile and very nice in mix and matching! now you paired it with some floral and some fall elements!! very Chic I must say!!! love the floral and burgundy!! Could I trade some of your autumn cold for my warm tropical weather? And you are dressed so snugly for fall! You have too many photos??? I always say I'll take a few in advance but then I take them that same day hours before posting. :D You're a really diligent one, aren't you? I'm jealous. :) And these maroon tights are prefect, I'm loving the color! Ah, tights season. I am always excited to break out the rights but man, I'm sick of them by april and there is still two monthd of winter left at that point! ( but at least the tights cover up bruised legs and yay for no shaving! Woot!). I reslly love the bright tights and the pretty skirt with the badass boots, that's awesome! GREAT outfit! I love your beanie!